With my fronts and backs knitted, this month’s meeting focused on planning for my sleeves, including the shoulder saddles. We reviewed swatches for the pattern to run up the sleeve and across the saddle. 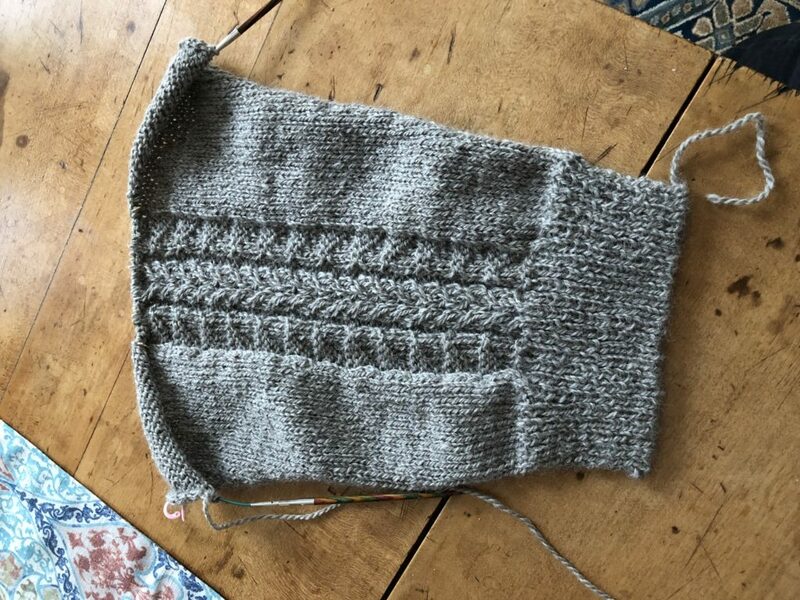 I had decided on pairing the slip-stitch cable used on my fronts and backs as a center sleeve motif to continue through the saddles, and had a few options for side motifs. Kirsten agreed that the scaled-down flag motif worked best. I had started calculations for stitch counts and rows between the sleeve increases, and it seemed I was going to need increases less than an inch apart, which seemed off to me. We talked about ease allowances, and Kirsten suggested that I would probably want more ease through the wrist — increasing that measurement puts my increases at 8 row intervals, or just over an inch apart. 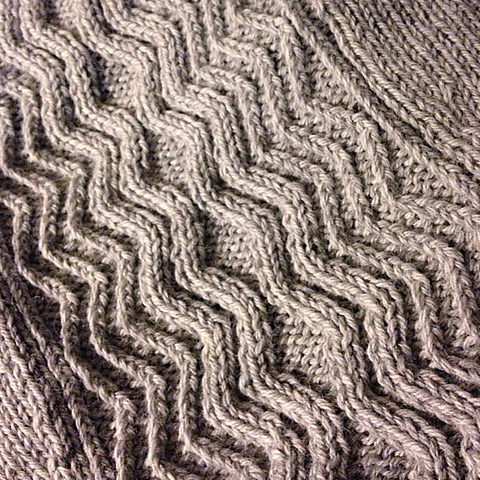 My tubular cast-on has the right number of preliminary rows, and the slight ridge at the base of my ribbing is normal. The i-cord bind off on my button bands is a better solution than the sewn tubular bind off I had originally planned, given the continuous length of yarn I would need up the whole front and through the collar. I need to Standardize my technique on the right-slanting side of the zig-zag cables — it looks consistent on my back swatch, but the quicker method I tried on my front swatch looks loose and a bit messy compared to the leftward slants. As much as I love the look if that braided twist cable from my first back swatch, I shouldn’t try to add it to the tail edge or sleeve just to include it somewhere — I left it out for a reason. Repeating the three-stitch cable on the tails and sleeves will give the overall design a more cohesive look. We talked saddle width for the shoulders — narrow works here likely two inches. I’m ready to cast on an start knitting my sweater! Rough estimate of how much extra yarn needed for a cabled garment: add 25% (Thanks for this Kirsten, estimating has been keeping me up nights). 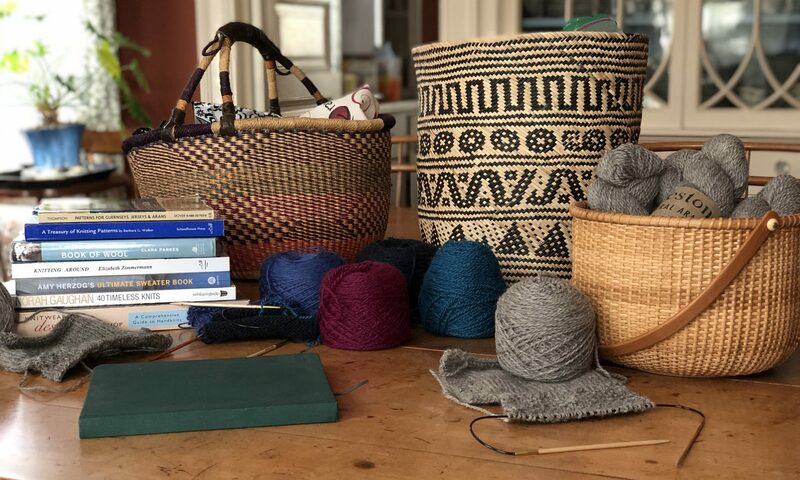 Kirsten validated my concern about trying to sew a tubular cast-off for the full length of the sweater front plus collar – alternatives to mull over include an integrated button band, reinforced with a crochet chain stitch, or an I-cord edging. Zig-zag travelling stitch is reversible, and a good alternative to a potentially messy reversible ribbed cable as there are fewer stitches to cross in any given row. Saddle-shoulders work well with a center-cabled sleeve. Back to the sketch book for a first round of design revisions – the patterned panels are coming into focus.